Wedgewood has two tennis courts that are normally operational from early spring until late fall during the daylight hours. 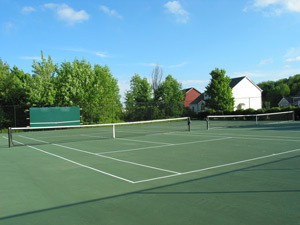 The courts are located behind the clubhouse. The courts are open for the current Wedgewood residents with no outstanding dues and their accompanying guests. A practice backboard (8’ x 20’) is also installed on the north side of the fence of the first court. Board appointed staff does not man the courts and the residents are requested to self-comply with the posted rules. Issues may be brought to the attention of the Board at whoa@Wedgewoodhoa.org. One Wedgewood homeowners resident per court required. An adult must accompany children below 13 years. Do not disturb the net crank wheel. No horseplay / skate boards / roller blades / bicycles /hockey. Tennis shoes are the only footwear permitted on the tennis courts. Please use trash containers to help keep YOUR tennis courts clean. Last one out to lock the main door.